"Come and stay a month with us. Come and stay until you get healed and have your faith built up enough to stay healed. The Spirit of God is moving, and the Word of God always works!" You are healed. That's the message those who attend Healing School hear. And it's the message Rev. 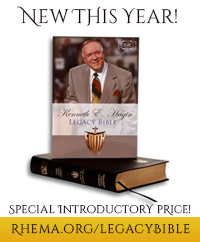 Kenneth E. Hagin intended for them to hear when the school began in 1979. Brother Hagin believed that people need the medicine of God's Word. At Healing School, that Word is put into action every day. Healing School is a place, as Brother Hagin desired, where the sick can go and have faith put into them, so to speak, rather than have their faith taken out of them through religious tradition and unbelief. It is a place where the sick are healed and the oppressed are set free—a place where miracles happen every day! "If you're thinking about attending Healing School, don't hesitate. It could be exactly what you need. Nothing is too big or small for Christ. You can be healed from anything! You are already well, and the people at Rhema's Healing School will help you realize it and receive it." "We've got the life of God in us and we are more than conquerors! We need to look in the mirror and say, 'Hello, healthy body,' because when we speak what God's Word says, we will see it manifest." "Don't be concerned about what you did or did not do. Just know that you are healed by Jesus' stripes. He paid the price. All you have to do is believe it and receive it." "You're healed because of the finished work of Christ. Jesus paid it all, and His victory is your victory. Remind yourself of this on a daily basis. Say, 'I actively participate in what Christ has done,' and enforce the life of God that's already on the inside of you!" "You don't have to strive to get your healing. You've got it! Your Father loves you. He loves you so much that He stepped into a flesh body for you. Let that life flow." We believe that everyone who walks through the doors will be healed.